I’m not sure people realize how traumatizing fireworks are for dogs. To a dog, those loud booms and whistles sound as if the walls are coming down around them. Their instinct is to flee and many of them do. For the dog…not you! I gave Misha a sedative for the 4th of July. It really helped. But, the fireworks have gone on far beyond the holiday. They start a week before the 4th and people are still shooting them off two weeks later. I can’t give Misha a sedative every night, neighbors! See how terrified she is? 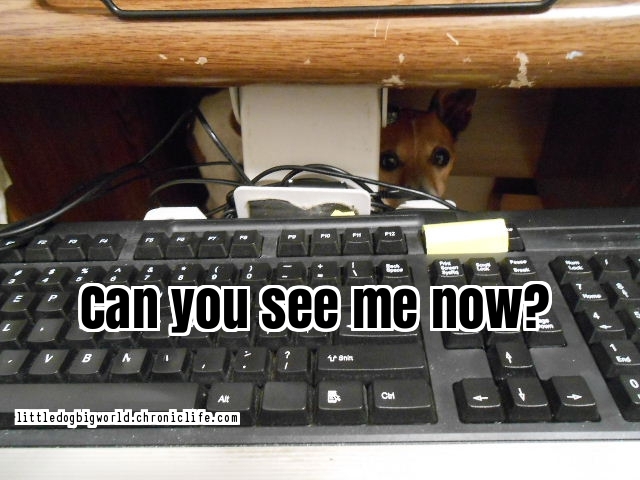 She climbed up on the box under my desk and stared at me through my keyboard tray. There’s nothing I can do to make her feel safe. 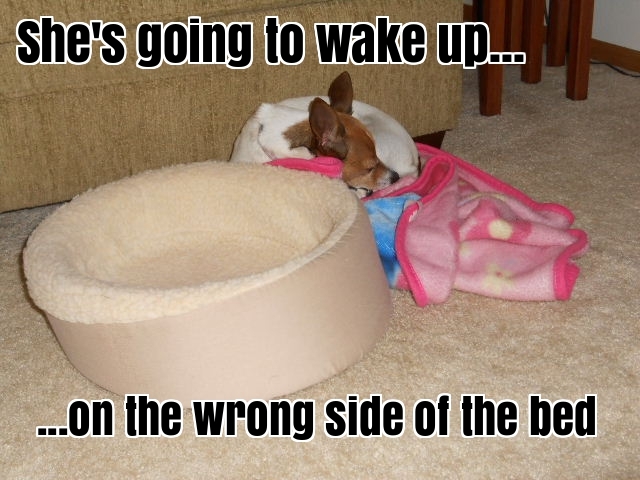 Did you know that when you give your dog a sedative the effects linger through the next day? That’s right. This is why I take the decision to give Misha acepromazine very seriously. I use them sparingly and only when absolutely necessary. While the after effects of a sedative can be mildly amusing for humans, it’s not really fair for the dog. If you know Misha and her blanket, it’s some serious stuff when her blanket is not in its proper place in her bed! She was too tired the next day ask for help. I’ve had people tell me, “Oh, just give your dog the sedative! It’s only one day!”– but it’s not “just one day”. I can’t drug my dog all dang summer! I wish they could see my dog’s terror. They don’t realize how terrifying fireworks are. Is your pet afraid of fireworks? How do you cope and keep your pet from freaking out?